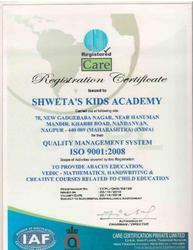 Started in 2009, Shweta’s Kids Academy, an ISO 9001:2008 certified company, is continuously growing in the market. We are manufacturer, supplier and exporter of Abacus and Training Courses. Our wide range of product includes Abacus Books, Abacus Study Material and Abacus Bags. Also, we are the leading service provider of Trainings and Franchise and Montessori Teacher Training Courses. 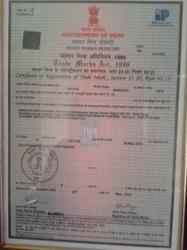 All these products and services are widely demanded across the world to teach the children in effective way. We supply best study and teaching material to all our clients which suit best to the developing mind of the children. These products contain best material for the students who are in the lower standards. Additionally, our firm is praised in the market for offering best teaching solutions to all consumers. With the team of teachers and skilled professionals, we are offering best study material to all our consumers present across the world. Meeting to the basic thing which is required to teach small children, these books and other materials are best in the industry. Additionally, we offer best training and franchise to all consumers to bring perfection in teaching. We give nursery teacher training to teach how to handle the children of the class with love and care. These trainings are widely acknowledged among the consumers for best result. With the guidance of Mr. Jagannath Yadav we are sharply growing in the national and international market and offering best study material to teachers and patients at nominal charges. Trading, Importer and Exporter of Abacus and Training Courses. Our team comprises of experienced teachers, qualified professors, experienced consultants and skilled technicians. The books, materials and equipment are created and manufactured by above mentioned scholars who always think progressive and innovative. Furthermore, the constant thirst for knowledge has encouraged our team members to opt for higher education or degrees always. In addition with it, the team has a vision to become number1 in child education within few years across the nation. To boost the child''s moral fiber. We target at training the children to use their extreme ability. 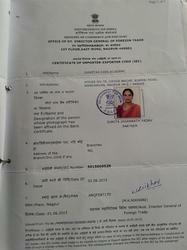 To become NO.1 in child education. Shweta’s Kids Academy is the hub where students, teachers and parents find authentic books, efficient study materials such as abacus, and easy to understand equipment. Here, the quality-education meets sophisticated approach that help built a smart generation which is equipped to empower society and nation and the world. Entire services and products are made available at reasonable prices to the users. To invent robust and systematic educational products such as abacus, books, and equipment; we have set up an advanced unit where every production finds a spacious room. Thoughts always need space and the technology for delivering innovative ideas; therefore, the merge of high-end technology and ultramodern equipment can be seen at our unit. The warehouse always has efficient storage of products to cater numerous consumers at a demanding period. Compromising on production has zero tolerance here. 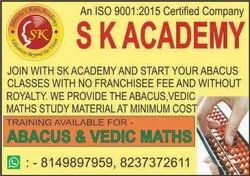 GET FRANCHISEE OF ABACUS AND VEDIC MATHS AT VERY LOW COST AND EARN MORE. INDIAS NO. 1 ISO 2018 CERTIFIED TRAINING COMPANY WILL PROVIDE TRAINING FOR ABACUS AND VEDIC MATHS AT VERY MINIMUM COST. YOU START YOUR OWN ABACUS CLASSESS AND EARN MORE THAN 25000 RS PER MONTH.